Time for a shower....A meteor shower! Heads up for all the skywatchers in the house, the meteor shower of the decade is taking place on Friday May 23 and lucky for us it's a Weekend! The first and last time I saw one was back in Canada and it was a truly mesmerising event. That coupled with the fact that I was with a bunch of my closest friends made night unforgettable. So now all if you have a chance to make amazing memories of your own and watch a rare and facilitating event, which sometimes is only once in a lifetime event. So don't miss out! 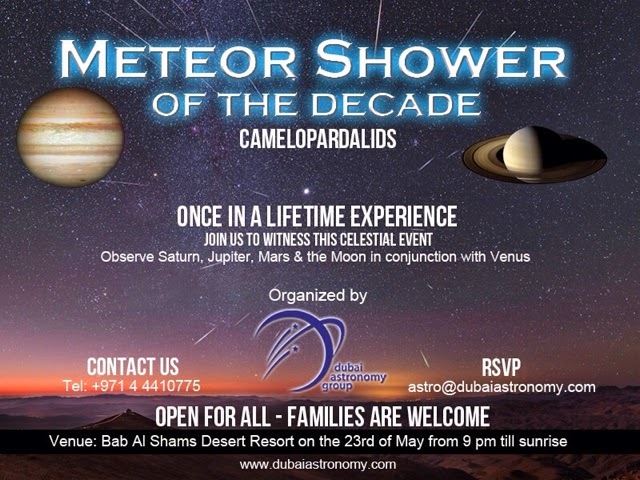 Dubai Astronomy group is hold an event at Bab Al Shams to guide us through the media shower. The event is free, obviously becuase no one is going to charge your for looking at the sky, which is great! The deets are mentioned below the poster. Hopefully I will see you all there. P.S. My sources say the peak of the shower is supposed to be between 12 am - 2 am on May 24. Predictions suggest that a newmeteor shower will be seen on the 24th May as Earth is expected to cross the debris trail left by comet 209P/Linear. Based on professional forecasts this meteor shower could turn out to be a unique meteor storm. A meteor storm could see dense outbursts of bright multiple meteors and provide in excess of 1000 shooting stars an hour during its peak. Lowest expectation would be 60-100 meteors an hour. You won’t want to miss this…. This Dubai Astronomy Group event will also provide visitors an opportunity to look through the club telescopes at other celestial objects including; Saturn, Mars, double stars, globular clusters, nebula and other deep sky objects. In addition, the Moon rises in the morning, just before sunrise, in a close conjunction with the planet Venus. The event will feature live presentations and videos about the night sky plus featured online broadcasts to the wider international astronomy community. The event is working in collaboration with Astronomers without Borders and will feature live links between Dubai and California. The event is also supporting a global broadcast from Slooh Telescopes. Slooh operate a network of robotically controlled telescopes which are used by its worldwide membership for Astronomy imaging and observing. Slooh is a major worldwide outreach facilitator of public astronomy and hosts regular online events. Dubai Astronomy Group is a listed partner. The event will also include periodic Live Google+ Hangouts On Air and will be available on YouTube for those unable to attend in person.